Floribunda Roses are a modern day term used to describe a class of roses that were created in the early 1900's by crossing polyantha roses with hybrid tea roses. The first of which was introduced in Denmark by breeder Dines Poulsen. There seems to be some dispute as to the actual year the first new variety of this crossing was introduced, called Rodhatte, in either 1907 or 1912. In the beginning, these types of roses were first called Hybrid Polyanthas. Over the next couple of decades, the Poulsen family went on to create several different varieties of Hybrid Polyanthas including the Else Poulsen rose in 1924. It wasn't until 1930 that a hybidizer, working in the United States for Jackson & Perkins, named Dr. J.N. 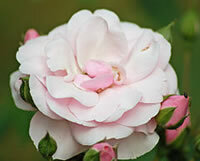 nicolas first coined the name floribunda to describe this class of roses. The name stuck and ever since roses of this crossing have been named as such. Floribunda roses are created with the intention of capturing the profuse blooming characteristics of a polyantha, coupled with the range of colors and absolute beauty of the hybrid teas. Floribunda roses will often carry with them all the colors and splendors of traditional hybrid tea roses, however they tend to be shorter and have a more bushy habit than their parentage. Floribundas tend to produce blooms that are smaller in size than the hybrid teas, however they will often produce them in large clusters that more than make up for their size. Many varieties of floribundas tend to be repeat bloomers and if you provide them with the proper care, they will reward you with a great many blooms over the course of a single growing season. For starters, heavy bloomers require a lot of sun light to do their best work. As a general rule of thumb you should try to find a site that offers your roses a minimum of 6 to 8 hours each day of direct sun light. There are some types of roses that are capable of thriving in partial shade, and while these make themselves extremely versatile across a wide range of landscaping ideas, few roses will perform as well if you give them full sun all day. It is also preferable to provide them with the morning sun as this will help dry out the dew early on in the day and add to the overall health of the leaves and the plant itself. 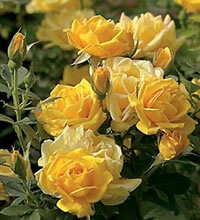 Planting floribunda roses is not difficult and they are much like any other type of rose. I always recommend to gardeners that have not done this before to do themselves a favor and take a trip to the local garden center and pick up a bag of a good organic compost. When you dig your hole, mix this compost in with the loose soil at a ratio of 2 parts soil to 1 part compost. Your plants will get a huge boost and establish much more quickly than in stale old garden soil. If you bought your rose from an online vendor, they most likely shipped it to you as a bareroot plant during the time of the year that is suitable for your region. You should first soak the plant overnight in a bucket of lukewarm water to rehydrate the roots. Then dig yourself a hole that is at least as wide as the longest roots the plant came with. You should also make sure it is deep enough to set the plant atop a mound of soil, and still keep the bud union an inch or two below the surface. Once you have your rose set in place, spread the roots out in all directions around the mound of soil and then back fill the hole about halfway with your new soil mix. Take the garden hose and water this soil heavily until it flows around the roots like mud, then go ahead and back fill the hole the rest of the way. Give it one more heavy watering to fully settle the soil and you are done! If you were fortunate enough to find the rose you wanted at a local nursery, then it was more than likely already planted and established in a container. These are the easiest to transplant because the guesswork has already been done for you. Dig yourself a hole that is at least twice as wide as the diameter of the container, and equally as deep. This will leave you plenty of room around the root ball for your new rich soil mix, while still keeping the bud union at the same depth it was in the container. Taking care of your roses is rather simple but it does require some diligence on your part. You should make sure that they receive one deep watering every week whether you do it or if Mother Nature takes care of it for you. If you are ever unsure about if it's time to water your roses, stick your finger into the soil at the base of the plant. If your finger comes out wet, you shouldn't water them again yet. Roses will do very well if you give them a dose of a granular all-purpose fertilizer in early spring when the leaves start to form. For many varieties this is sufficient however repeat bloomers can benefit from additional feedings throughout the growing season. I will usually give the second feeding right as the first big bloom starts to develop, and then a third feeding later on around mid summer to promote additional blooms. Just be sure to follow the dosing instructions and I always like to allow about 4 weeks in between feedings. You should always prune your floribunda roses in early spring when the weather breaks, but before the leaves open up so you can see what you are doing. Start by removing all the dead wood, along with any canes that may look discolored from disease. Next, prune back any lateral canes that overlap as these will inevitably compete for sun light once the leaves fully open up. Lastly, cut back the remaining canes about one third of their height to promote new growth. If you live in a colder region, you may have to cut them back halfway or so. 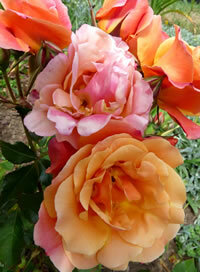 This is also a good time to clean up around the base of your floribunda roses. Never let dead leaves and debris from the previous season lay around your roses. These can turn into breeding grounds for pests and diseases. Always throw away this material, along with your cuttings, in the trash. Never throw them into the compost pile because many spores are capable of surviving even the cold winter months to re-infect plants the following year. I always finish up by giving my roses a fresh layer of mulch to start off the new season.